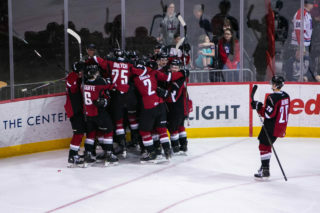 Tonight at the Langley Events Centre, the Vancouver Giants put their six-game winning streak on the line against the top team in the entire CHL, the Prince Albert Raiders. These two teams will meet only once during the regular season and tonight the Giants look to become just the eighth team to hand the Prince Albert Raiders a loss this season. The Raiders have been on the road now for 11 days and during their swing through the B.C. Division they’ve managed to go 3-0-0-1. Tonight’s game is the only WHL game on the docket tonight. The Prince Albert Raiders are the top team in the WHL, largely because of their potent offence led by 1999-born forward Brett Leason. After putting up 33 points in 66 games last season, Leason has exploded in 2018-19, establishing himself as one of the most dominant players in the league. The Calgary, Alberta native has chalked up 31 goals and 73 points in 39 games. 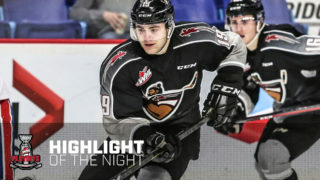 In December the undrafted forward earned a roster spot with Team Canada at the 2019 World Junior Championship. Standing at 6’4”and 200-pounds, Leason is a handful for most defenders in the WHL. Coming into tonight’s game, Leason sits fourth in league scoring, third in league goal scoring, third in league plus-minus, fifth in shots-on-goal and tops in the league in both game-winning goals (8) and shorthanded goals (5). Leason suited up for Team Orr in last night’s Sherwin-Williams CHL/NHL Top Prospects Game and scored a goal in Team Orr’s victory. 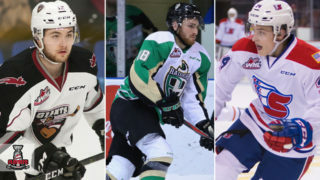 Out of Delta, Prince Albert Raiders forward Dante Hannoun has been a thorn in the side of his hometown Vancouver Giants throughout his WHL career. As a member of the Victoria Royals, Hannoun laced up against the Giants 41 times and racked up 14 goals and 39 points. 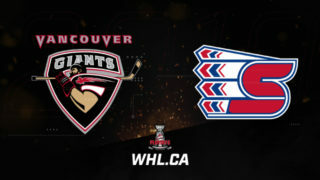 In his final WHL season, Hannoun will play the Giants for the first time as a Raider, but the last time in his career tonight at the Langley Events Centre. With 44 points in 37 games so far this season, the Giants will have their hands full as they try to keep Hannoun (who know wears #17) off the score sheet. The Prince Albert Raiders began their BC-Division siege sitting comfortably atop the WHL standings (36-5-0-1) and have not budged. Starting off in Prince George on January 16 against the Cougars, the Raiders put six up on the board in a convincing 6-2 victory. Next, the number-one road team in the league stopped off for a 4-1 win over the Kamloops Blazers. Perhaps a little tired, the Raiders had some trouble with the Kelowna Rockets the following night, losing 4-3 in a shootout. The next stop on their BC-swing was on the island to face the Victoria Royals who fell 4-1 to the visiting Raiders. With at least a point in each game on the trip so far (3-0-0-1), the Raiders hope to continue the trend tonight against the BC-Division leading Vancouver Giants who have not lost at home dating back to December 14. 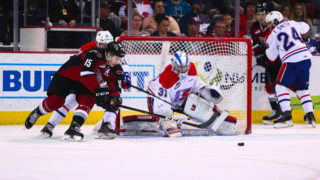 Surrey product, Davis Koch has been a consistent offensive catalyst for the Vancouver Giants since joining the team at the 2017-18 trade deadline. This season, the 20-year-old is leading the Giants in scoring with 16 goals and 31 helpers for 47 points in 43 games. 14 of those points have come in his last six contests, including back-to-back game-winning goals in each of the past two games. Koch has found a lethal amount of chemistry with two newcomers, Jadon Joseph and Tristen Nielsen – the trio has combined for 31 points in their last six games together. The Giants will be looking to Koch to continue his strong play against a powerhouse Prince Albert Raiders squad who have scored the most goals of any team in the WHL. The last time Koch saw the Raiders, he was wearing an Edmonton Oil Kings sweater. He found the back of the net twice in a narrow 5-4 overtime win on December 2nd, 2018. Coming in at #4 for North American skaters on the NHL Central Scouting’s Mid-Term Rankings List was Giants d-man Bowen Byram. The Cranbrook product is currently second in team scoring with 16 goals and 43 points in 43 games and sits fifth among WHL defencemen. He leads the entire CHL in goals for defencemen with 16. He represented Team Cherry in last night’s Sherwin-Williams CHL/NHL Top Prospects Game. Also cracking the list was Giants goalie, Trent Miner who was ranked at #6 among North American goaltenders. Miner is sitting on a WHL’s third-best goals-against-average (1.91) and the a WHL’s second-best save percentage (.931). He’s earned two shutouts this season.